How you and your friends play games together just got a lot easier. The world of gaming changed about a decade ago when online gaming became possible through high speed internet. At the same time, social networking through Twitter and Facebook has grown exponentially. Sony's betting that we want to be able to share our gaming experiences in a more streamlined manner, and revealed a bevy of features at its press conference this evening for the PlayStation 4 that aim to do just that. You can share what you're playing with the touch of a button! No, really. 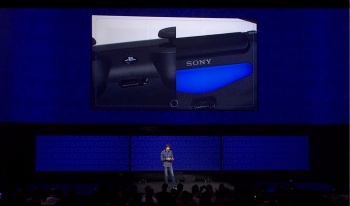 The Dual Shock 4 controller unleashed at the presser has a designated "Share" button in shiny blue. Pressing that button will let you broadcast your live game to your friends in "100% real time". Your friends will be able to "look over your shoulder vistually" and interact with you while your playing, putting comments on your screen. Not only that, but if you get incredibly stuck in a certain section, your friend can even take over control of your game all over the interwebs. He'll need your permission of course, no cheeky jumping into his Uncharted game just to muck him up. Streaming your play onto the web using services like Ustream will be completely integrated with the PS4 interface as well. It doesn't just stop with the PS4 either. Sony didn't promise that every game will have Crossplay functionality with the handheld PS Vita, as they demoed at the presser with the new game Knack but it's a "long term goal to make every PS4 title playable on the Vita by using WiFi Remote Play." The catchphrase Sony bandied about for this section of the presentation was "Everything Everywhere." The promises Sony is laying out tonight are piling up - here's hoping this crazy dream becomes a reality.